When we left California in 2002, we weren't birders. We returned in 2012 with a new hobby and have slowly been seeking birds in California to add to our life lists. 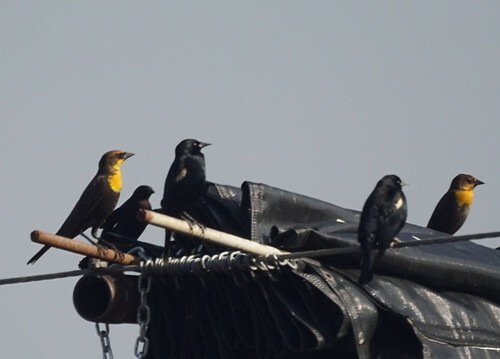 We knew there were yellow-headed blackbirds in the area and have tried a few times to see them. This weekend they were on the top of our list. Some had been reported near the San Jacinto wildlife area. We found a few mixed in with a few thousand blackbirds at a dairy farm near the wildlife area.